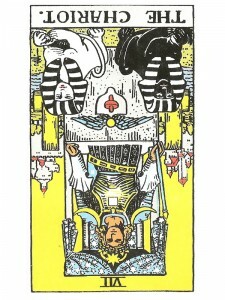 The Chariot (R) suggests that your approach of will-power has proven unsuccessful – this situation is out of control. Be alert to situations which indicate the wrong use of your energies and recognize the negative vibrations of unfairness, force and pressure. Become sensitive to those involved in your situation who have no concern or consideration. Recognize that you are wasting your energy when you indulge in these emotions – forcing too much energy to be channeled through an overbearing attitude and the application of unnecessary force. Seek another approach to your difficulties – will power alone cannot always sustain you. Learn to give way to the spirit within you – for your “Inner” Self is always prompting you to learn the true values of life. You can enjoy everything, but you can not possess anything – for it is not yours to possess in the first place. Unhappy thoughts are obstacles which can be overcome simply by stilling your mind. To rid yourself of the negative aspects in your life – never use your “force” in a negative way – choose to remain focused on the positive messages given by your “inner” voice, which will remove the negative in a graceful, positive, peaceful way in which everyone will benefit. It is time for you to test what you have learned – prove your abilities and in so doing prove yourself. Bring these unresolved contradictions and tensions under control. Distortion – too much or too little. Spinning your wheels, moving in the wrong direction. Too quickly, too slowly or not at all. Lack of flexibility in movement. Running away or running headstrong into a messy situation – retreat or a foolish attack. changing jobs too often or not often enough. Not enough or too much physical exercise. Building too much, too fast. Tearing down, reducing means. Accumulation of too much baggage, too heavy for your needs. Over feathering the nest. Physically over extended or not extended enough. Overly independent or much too dependent. 1. What mask are you presenting to the world? 2. What emotional reactions are you hiding? 3. What contradictions and tensions are you struggling to maintain control over? 4. Where have you experienced recent victory or success in your life? 5. What progress are you making in testing your abilities in the world? 6. Do you find yourself addicted to movement without advancements? In the first position: Much of this lifetime may be in the provision for others more than for self and to help them with their growth. In the second position: On the one hand, you may have been stretching too much, too soon. On the other hand, you may not have been stretching enough or not at all. In the third position: Your help may be needed in someone else’s move ahead, especially if you are a key player in their affairs. In the fourth position: It is not good to feel that you can or even should always come out ahead – especially if it means ahead of everybody else. Neither should you feel you need to lose out so that someone else can get what they need. In the fifth position: Plans may be too optimistic, too grand. Or, you may be holding back being overly conservative. In the sixth position: On the one hand, your opening and extroversion here is greater than best suits your karmic purpose. On the other hand, you are holding back at a time when you should be moving forward. In the seventh position: At one extreme, there is a hesitation, perhaps even fear of putting yourself forward. At the other extreme, there is an overconfidence that should be brought into line. In the eighth position: Either their is far too much movement and expansion/relocation or there is not enough. In the ninth position: You may be opening up to more growth than is appropriate, even into the realm of experimentation. Or, you may be far too close to opportunities and means of growth that are appropriate. In the tenth position: You may be called into action as a guardian angel to help someone else get their show in the road. While it is good metaphysics to wait until asked to intervene, the asking rarely comes in the form of an overt call for help. People with great needs often find it next to impossible, for a host of reasons, to ask for assistance. Can I just say, it is to find someone who actually knows what they’re talking about online!